(SPOILERS) Phil Lord and Chris Miller elected not to return as directors for this sequel (unlike with their other franchise, 20-something Jump Street), although they did contribute the storyline. Nothing about Cloudy with a Chance of Meatballs 2 suggests they spent more than 10 minutes brainstorming; if the first film saw them going for a disaster movie, here they take the lost continent/ unexplored island route. The result is visually much more inventive than its predecessor, but manages to be simultaneously both narratively formulaic and thematically confused. Cody Cameron and Kris Pearn make their theatrical debut as directors, while the finished screenplay is credited to Erica Rivinoja (a staff writer on South Park, but more importantly on Lord and Miller’s Clone High), Jonathan Francis Daley and Jonathan M Goldstein (partners on Horrible Bosses and The Incredible Burt Wonderstone, so a formidably average pair). Seven individuals contributing to the writing and directing is more than enough to come up with a complete mess, and to get to the point where they in desperation they decide to approve two “There’s a leak in the boat!” gags (it is funny the first time, but it’s the desperate comedian who repeats himself during an encore). 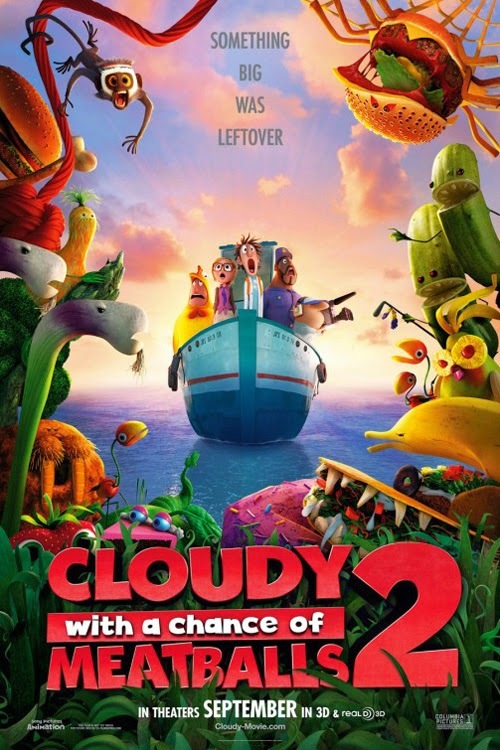 Cloudy 2 picks up directly after the original, unusual in itself for an animation, but any ground-breaking qualities end soon after. Flint Lockwood’s hero, master-inventor Chester V (Will Forte voicing a highly unsubtle riff on Steve Jobs), sends Flint and his chums to California. Chester, the CEO of Live Corp (Apple; Chester even unveils new improved versions of his famous food bar and has built “the coolest, hippest company in the world”) has been charged with cleaning up their island of Swallow Falls. This in itself has potential, running with the notion that science and business combined lead to untold pollution; Sallow Falls is treated like an oil spill of enormous food. Really, though, Chester just wants to get his mitts on Flint’s FLDSMDFR. Hampered by mutant food creatures (monster cheeseburgers in particular) Chester calls on Flint to find and destroy the FLDSMDFR (so Flint thinks). So it’s the big mean corporation up to no good, which is fine but the delivery is entirely half-hearted. There’s no relish to go with the rampant foodimals. The transformed Swallow Falls is the best feature of the feature. Arriving in mysterious, overgrown land, the inspiration is clearly the mist-shrouded Skull Island and the Lost World (the Jurassic Park one, that is) complete with a technicolour explosion of assorted oddments of animal food hybrids. They probably needed the five writers to come up with the different medleys; shrimpanzees, cantelopes (okay, that’s good), water melonphants, bananostriches and guacodiles (there are also spring onion diplodocuses and hipotatoes); an entire ecosystem of living food. Which provides a solid series of sight gags, but there’s little else here. Flint’s enrapture with Chester (they were even both bullied at school) leads to him shunning his friends, leading to an awkward churning of sentimental drivel concerning the power of friendship; as with the first picture, none of this feels remotely genuine. It’s there because that’s what’s required of a family animation. And yet, there are some very peculiar implications in all this. The vegetation gone sentient can only be seen as an allusion to GMOs (which Chester plans to put in his food bars because they’re extra tasty). Which makes Flint, as before, a really highly destructive force. One might suggest there’s a subversive streak, as the picture ends up at a point of protecting these foodimals from being skewered; “They are living creatures!” Perhaps the makers want kids to avoid GM food for sentimental reasons, since telling them it’s bad will do little to dissuade them. That’s clutching at straws, though. The very strange thing is that one moment anthropomorphised vegetables are a no-go area but the next Flint and his dad are killing fish in a father-son bonding session. Accompanying wit and commentary are in short supply, aside from the lazy Apple material. This time, alternative fuel sources go no further than “a zero-emissions car that runs on cute”. There are a number of vulgar gags, the best of which is “Stand back – I’m going to cut the cheese” and the worst involve a baby strawberry shitting jam out of fright and Brent soiling his diaper. I appreciated the use of the Six Million Dollar Man sound effect. It can only be a matter of time before Lord and Miller remake it. Given the four-year gap, one might expect more than a “churn it out” sequel but the original wasn’t really all that special in the first place. Cloudy 3 will no doubt be along in a couple of years. Hopefully there will be a bit more thought behind it, lest we get another movie where the subtext is that Monsanto are the good guys and Apple are the bad ones (the pendulum may be swinging against the latter, but such a take on the former beggars belief).